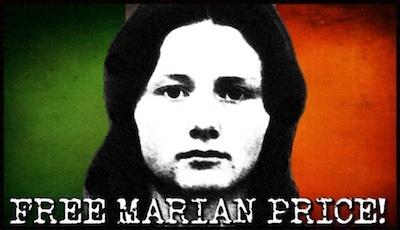 Supporters of human rights across the world are urged to write an individual letter to British Direct Ruler Theresa Villiers and their local elected representatives to call for the release of Marian Price. The following is an appeal by Pauline Mellon of the Justice for Marian Price campaign. At this point Marian Price is seriously ill. We would ask that people write to their elected representatives and those in authority to demand Marian’s immediate release. I would also suggest that you write to the Justice Minister David Ford, the Deputy First Minister Martin McGuinness, the Taoiseach Enda Kenny and the Secretary of State Theresa Villiers. I have attached a letter that can be downloaded or indeed if you prefer, write your own. Please request that ten of your contacts write to the following people also. I would like to draw your attention to a situation that can only be described as a travesty of justice. The situation I refer to is the ongoing internment and torture of political hostage Marian Price. Fourteen years after the signing of the Good Friday Agreement a 58 year old woman suffering from a litany of chronic illnesses languishes in isolation under armed guard in a hospital. Her health conditions exacerbated by the treatment she has received at the hands of the Westminster Government, facilitated by the Northern Ireland Assembly. An assembly set up under the same Good Friday Agreement which promised us that its criminal justice system would deliver ‘justice efficiently and effectively’, the same Good Friday Agreement that promised measures ‘compatible with a normal peaceful society’. Need I remind you that this is the year 2012, internment and torture have no place in a ‘democratic and normal peaceful society’. The ongoing detention of Marian Price is in breach of the European Convention on Human Rights and fundamental freedoms Article 5 guaranteeing the right to liberty and security of the person, as Marian’s ongoing detention without trial amounts to administrative internment. Marian’s detention is also in breach of Article 6 that provides for the right to a fair trial, including the right to a public hearing before an independent and impartial tribunal within reasonable time. The Public Prosecution Service have failed to bring the case that led to Marian’s internment forward within a reasonable time frame. On September 27th Marian’s solicitor stated publicly that the prognosis was that Marian’s health was “not going to improve”. He said she has been examined by UN, prison and defence doctors and their consensus was that she could play no part in court proceedings. With this said, why does Marian Price remain in gaol on bail with no chance of her health improving in an environment which is not conducive for recovery. As citizens we must ask why have a legal system when an unaccountable politician, with no mandate in the north of Ireland can overrule the judiciary to keep a seriously ill woman in gaol on bail? This politician is a representative of a political system that clearly seeks to contain Marian Price at any cost using methods that contravene the European convention on human rights. With the use of alleged ‘secret evidence’ the grounds for challenge are limited. How do you challenge what you cannot see? A credible justice system includes open and transparent justice with human rights protection, something that this alleged normal peaceful society seems to be lacking. Justice is a core element in the establishment of true peace internment is not!